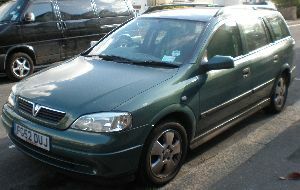 Description of car for sale : Vauxhall 2002 52 Astra 1.8L Manual petrol Metallic Green £2,600 91,000 miles, "This Is The 1.8L 16V Elegance. This Vehicle Is In Great Condition And Has 12 Months MOT, Service History And Warranty. The Price Is Negotiable"